Description of Injury: They damage the ear of the corn and stalk, chewing tunnels that can cause the plant to fall over. 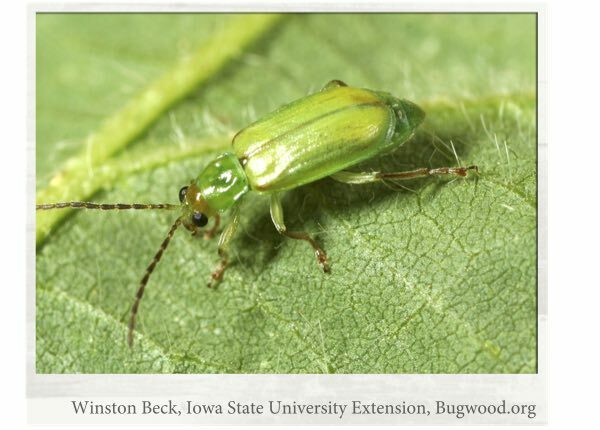 Economic Threshold: Control decisions should be based on projected yield, infestation levels, yield loss estimates based on estimated number of borers per plants as well as market value of crop. Description of Insect: Larvae- Up to 1 ½” in length. Can be various colors from green to brown or pinkish, they have light and dark stripes running down the length of the body. Adults-About ¾” in length with a wingspan up to 1 1/2”. Their bodies are light yellow to tan with darker markings on their forewings. Rear wings are paler with a darker border. 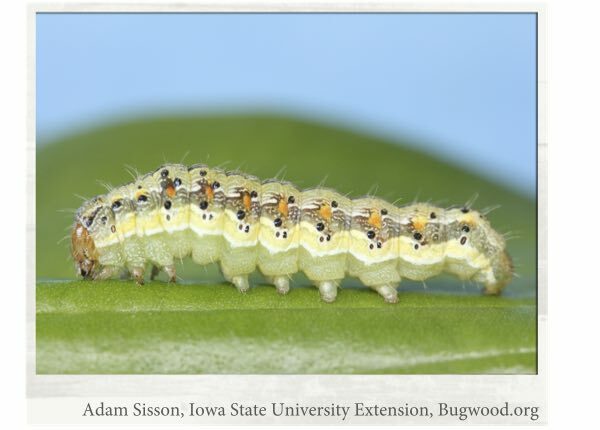 Description of Injury: The larvae feed on ear tip kernels and in the whorl causing shredded leaves. Economic Threshold: When silks are green and moths are being collected in traps, a 3-5 day spray schedule may be necessary. Description of Insect: Larvae-Can grow up to 1 ¾” in length and vary in colors from yellow and green to brown or dark grey. Economic Threshold: If 2 or more worms are found per 100 plant or 2-3% of plants show damage, control may be needed. Description of Insect: Larvae- White body with a brown head and dark plate on tail end. It can grow up to 1/2”. 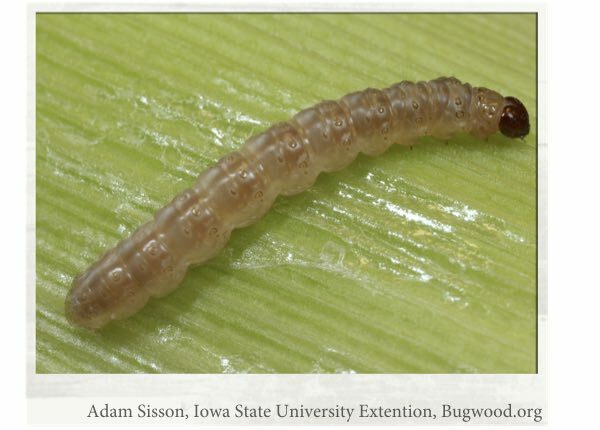 Adults- Northern corn rootworms grow up to ¼” and are a cream color that turns green with age. Southern corn root worms grow to ¼” and are yellow or green with 11 black spots. 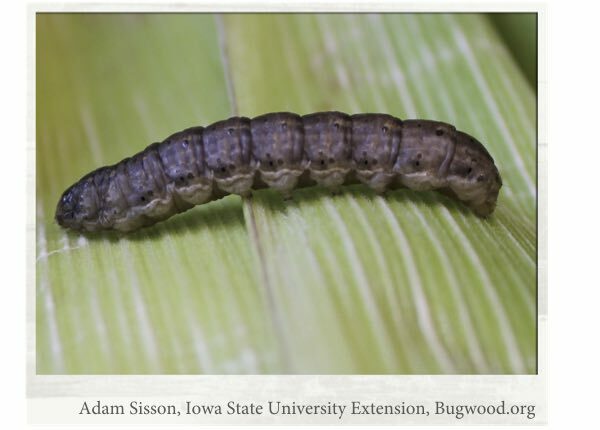 Western corn rootworm grows to ¼” and are generally yellow with black stripes, or yellow with a solid black pattern in males. Description of Injury: Larvae- Feeding on/tunneling into roots that can cause lodging or goosenecking. Adults- May feed on leaf tissue. Feed on and clip corn silks, which can interfere with pollination. Economic Threshold: If 2 or more worms are found per plant hand sorting or 8 or more when root washing, a cultivation treatment or insecticide may be necessary. Description of Insect: Larvae-Grow from 1 ½-2” and their bodies are light yellow to grey with stripes running the length of their bodies. Adult-A pale brown moth with a dot in the center of each wing. Description of Injury: Feeding on leaves can cause severe defoliation. Typically starts on the lower leaves and moves up, leaves can range from ragged to complete defoliation. 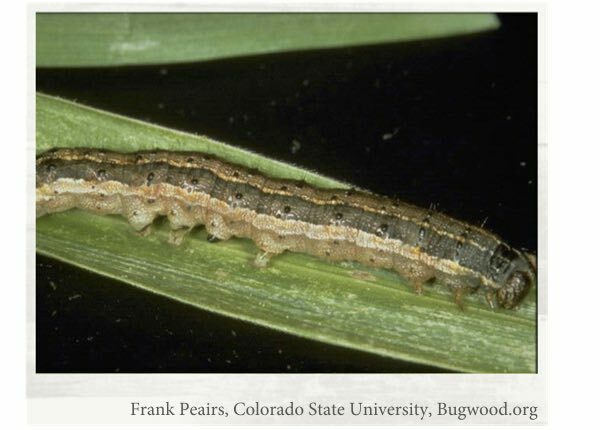 Economic Threshold: If over 50% of leaves show feeding and worms are still under 1¼”, treatment may be necessary. Symptoms: Lesions are initially light tan, but turn gray, and can have a light yellow halo around them when held to light. The narrow rectangular lesions can be up to 2” long and grow together killing entire leaves. Time of Occurrence: While the initial infection generally occurs in mid to late June, rapid spread does not usually occur until July or August. 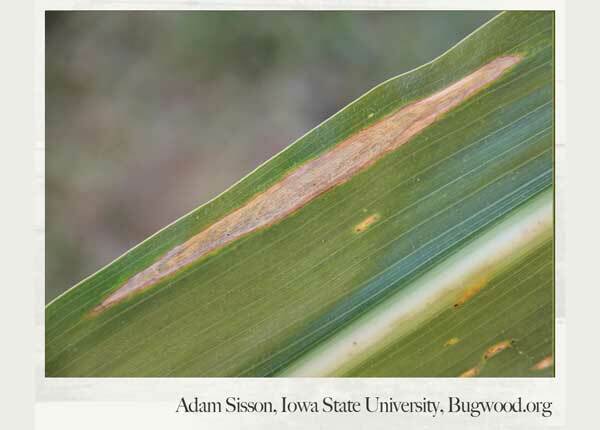 Conditions Favoring Disease: More prevalent in fields that were previously infected. 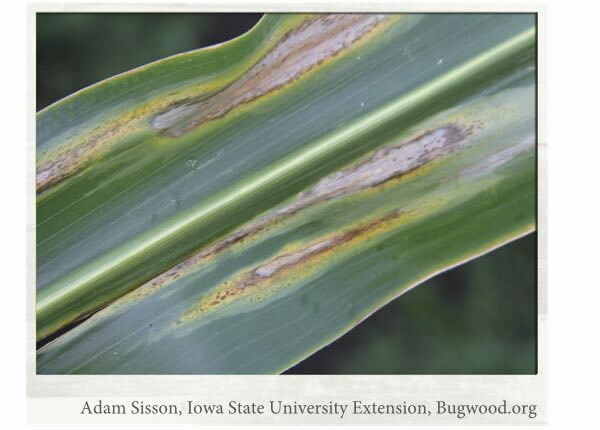 Warm temperature with high humidity and long dew periods, especially during silking and early kernel-fill favor this disease. Symptoms: Numerous orange pustules on leaf surface in dense clusters. Area around pustules is green at first, but yellow and then turns brown. Heavily infected leaves can wither and die. Time of Occurrence: After silking. 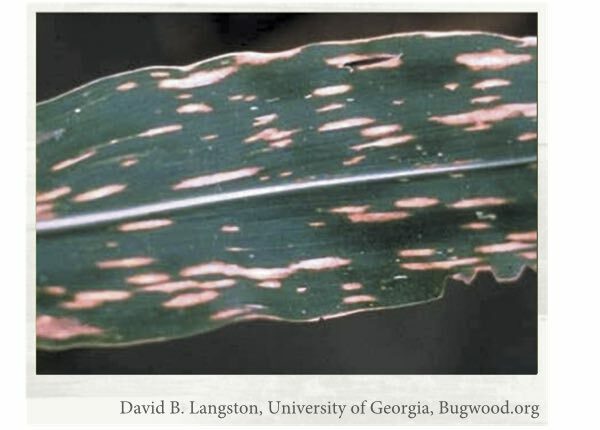 Symptoms: Brick-red pustules appear on both the upper and lower leaf surfaces, mostly on the upper leaves. The tissue surrounding the pustules may become yellowed. Severe cases can cause leaves to die. Time of Occurrence: Usually after silking, but sometimes earlier. Conditions Favoring Disease: Favors moderate temperatures and heavy dews. Symptoms: Long cigar shaped lesions that first appear on lower leaves. The lesions are initially grayish green but later turn gray or tan. Time of Occurrence: During or after silking. Symptoms: Lesions are tan with brown borders and vary in size and shape. They are elongated, and are typically between ¼-½” wide and up to 1” long. Time of Occurrence: Mid-whorl to maturity. 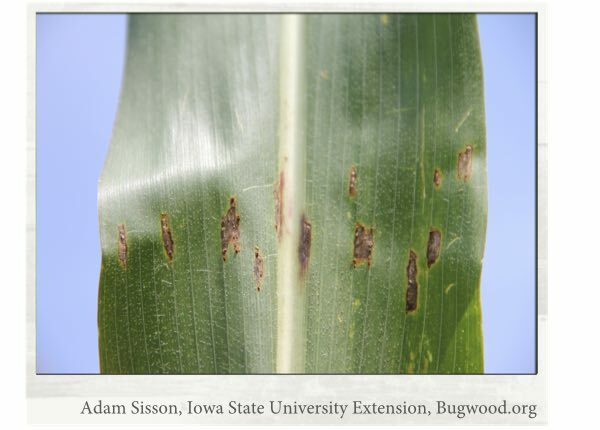 Conditions Favoring Disease: Favors warm, wet weather and continuous corn crops with previous years residue still present. 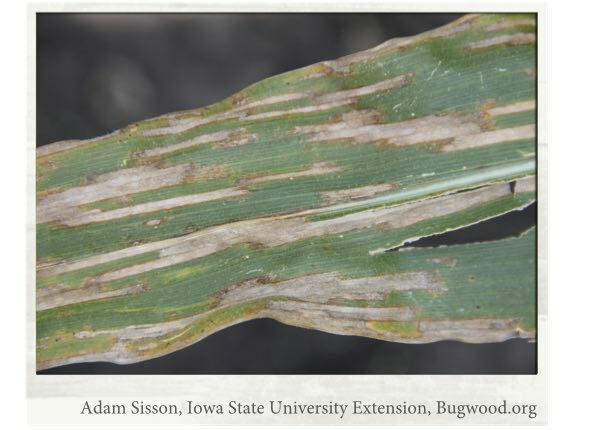 Symptoms: Leaves have light gray to dark tan, shiny lesions on the leaf surface with freckling. Lesions may grow together and some plants may also suffer from wilting and stalk degradation as well. Time of Occurrence: Anytime during growing season. 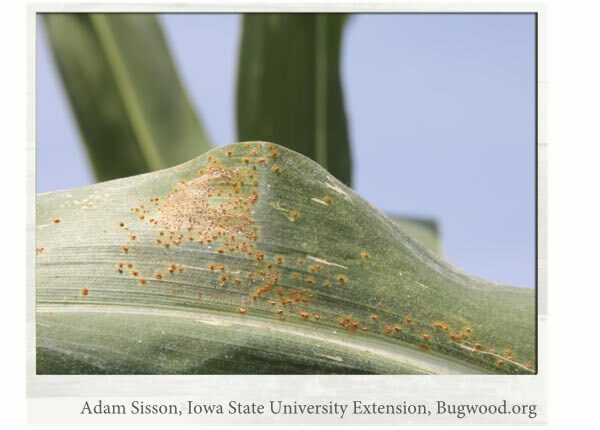 Conditions Favoring Disease: Fields with existing corn residue are susceptible, as the bacteria can remain in the residue, and enter in through wounds in the plant, possibly caused by hail, high winds or insects.